Lurline's Place: A Giveaway - Enjoy! It has been quite a while - I hope you are happy to try your luck! 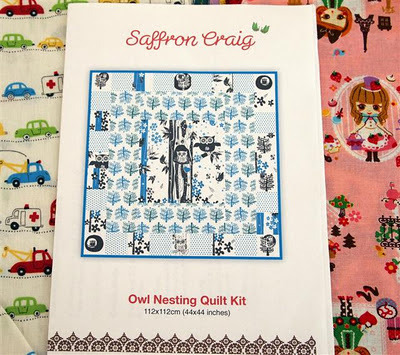 I am giving away the Owl Nesting Quilt Kit (44 x 44 inches) by our very own textile designer Saffron Craig - only 12" of the spot and the binding fabric are not supplied. 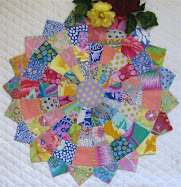 It will be very simple and lots of fun to make - instant gratification! - hmmm, do I really want to give it away, lol? Here's anothery! A Layer Cake of Sherbet Pips, a nice little pack of Meadow Friends by Moda and a super pattern by our own Melanie Hurlston, featuring gorgeous little elephants. I will close off this Giveaway next Sunday 16 October our time. No frills, you don't have to do anything special at all to enter - just have fun and maybe tell your friends. Perhaps the winner/s should have the choice of Number 1 or Number 2 - what do you think? I'd love you to leave a Comment, but more than likely I won't get to reply to all! I am still trying to be a little bit more regular with my Postings. Will say ta-ta to you with the smell of roses - Seduction I think it is and is somewhere linked to Iceberg - I did ask the opinion of the very nice young male assistant at Bunnings, Seduction!! - a few blushes and then I bought three, lol! - another has been given to me in the meantime by Girlfriends! - oh, I am so easily charmed! thanks for the chance Lurline. How generous! I would be very happy to win No. 2! Lovely giveaway. I'm definitely an nr 2 girl! Hope your name is in the hat too! You may just need to keep those pretties now you're friends with the new machine. Wishing good health in the coming months. Lovely! Thanks for the give away! I think both are great fun, so I don't mind! Such the beautiful roses ! And your giveaway is perfect, thank you. I would choose no.2. lovely flowers, and beautiful fabrics! Roses always remind me of my Dad, happy memories. Love those cute fabrics , especially the Moda ones. Thx for the chance to win either of these nice prizes. Beautiful flowers, they must smell wonderfully. Thanks for the lovely giveaway.I'd choose #2, if you please. I love both and I also love your roses....My garden only has azelias & rhododendrons flowering at the moment..still a bit chilly for the roses to bloom. hi Lurline i would be happy with any of the giveaways,it is very kind of you to offer such lovely prizes,love the roses. I'm far away from you so I understand if you don't want to include me in the giveaway. But if I'm included, I'd love to win either one. :D You're sweet to do this! Lovely prizes; I'd be happy with either one. 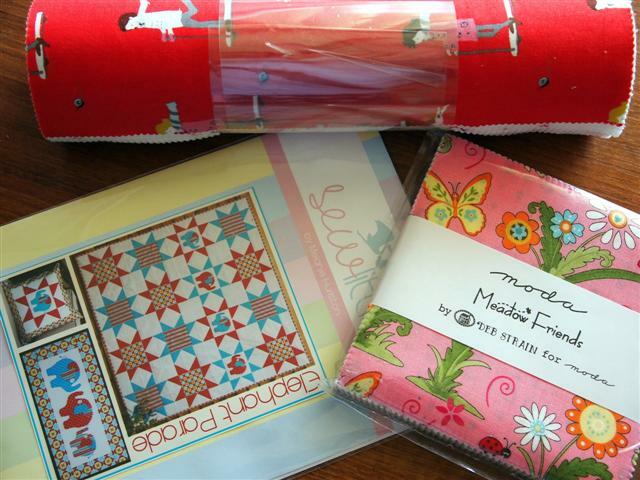 Thanks Lurline, for the chance to win such wonderful prizes of fabric. Oh, the joy of choosing between them if I won! Thanks for being so generous. Love those gorgeous Roses. I am definately a Rose girl. Especially the gorgeous fragrant kind. Love those sweet little elephants too. Thanks so much for a chance. I have a small amount of Pips and would love a bit more to get a project started. Off to check out your tutorials, thanks again. Hard to choose either gifty is a wonderful giveaway. Happy to have a chance. Hi Lurline, wow, both of those are fantastic give-aways, either of them would be fabulous to win. Deb Donovan, Perth. I just love those "sherbert pips"...so bright and cheery. Roses, how beautiful, I can't grow them here because the deer just eat them right up! and getting back to blogging, we missed you. Thanks for the chance to win these beautiful fabrics.I choose n.2.Thanks so much for the chance. I just love roses so much! And I sure love to join your Giveaway! Those are such cute fabrics! Thanks Lurline!! And a good week to you and your family too!!! most smell your roses! Just beautiful. I'd love to win either giveaway~ they are both wonderful! Thanks for the chance! Have a happy week! Oh hey, thanks for the giveaway. I would love to receive the Sherbet Pips, as I am in the middle of making a baby quilt using some charm Pips right now, and could use the layer cake to make the backing! How lovely of you to have such a wonderful giveaway. I simply love #2, it has pink & I love pink. What a sweet giveaway Lurline! My roses are having one last bloom of the season here. I could Definately do with a cheer me up moment after,well you know what's missing from my life, number 2 is my pick. Love that you are blogging again too. Lovely giveaway! Thank you for doing it! How wonderful! I think I'd choose number 2. Thanks for the chance! I love your roses, they are gorgeous, and I love the story that goes with them, gotta love Bunnings!!! What a great giveaway too, thank you! Beautiful roses - awesome giveaways! Your flowers are beautiful. We are starting into Fall and the flowers are dying out. I would love to win number 2, it's just TOO cute! Thank you for having this giveaway! What nice prizes for your giveaway and the roses are so pretty- Fall has arrived here and the trees are golden and in places bare from the wind. Such a strange thing to think that it is spring where you live and fall in the Northern Hemisphere. Quite the amazing world. Thanks for hosting your generous giveaway. Your winners are going to love your prizes. Lurline, it's lovely to see you back in the saddle again, I've missed your smiling face in blogland. 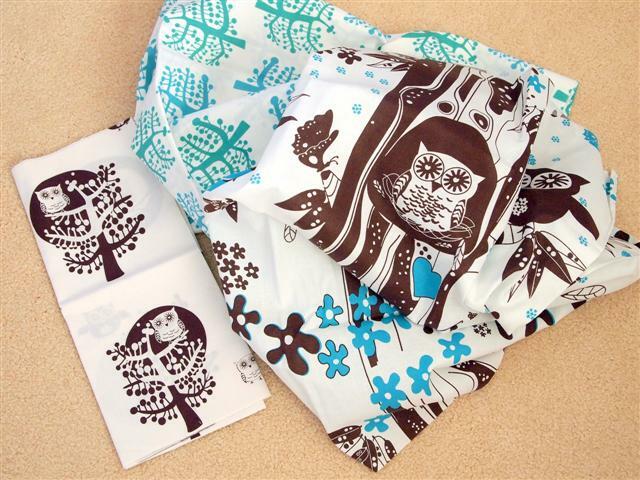 What a generous giveaway, thank you..
Love the owl brown and aqua combo. I seem to be buying lots of fabric with aqua in it these days. Thanks for the chance to win one of your giveaways. The roses are beautiful and are always a wonderful addition to the garden. Lovely giveaway. I also have trouble posting regularly. Would love to win the elephant pattern, however, my daugter is really getting into owls these days. Just love your blog. I would love to win either of your giveaways but I am partial to Owls and I do collect them in ceramic form. 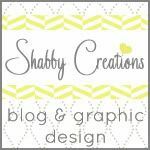 Your blog is great and I so enjoy seeing your work. Either of the giveaways prizes would be an exciting win but I do prefer the owl kit. Thanks for the generous giveaway! I'd choose #2 because I prefer elephants. Thank you. So much fun!! liking the Meadow friends ... so I'd pick #2 ... thanks! Oh, the smell of roses. It's fall now here on the west coast of Vancouver Island and while some roses are still blooming, mine have finally given up. Your giveaway looks fabulous. I'd probably pick number 2, but either would be wonderful. Super great, super fantastic giveaway. Thank you for the giveaway. Love your roses, beautiful! Beautiful roses and I would adore the second pick as I would love the Sherbert Pips layer cake. Love #2 like most other commenters! And thanks for not having to jump through hoops. Love your giveaway. Great giveaway! Please count me in! I choose No. 2. A very generous giveaway. I hope you will let me play along even though I am new to your blog. I have the Seduction rose, it is a great bloomer. Thanks for the chance to enter your lovely giveaway. 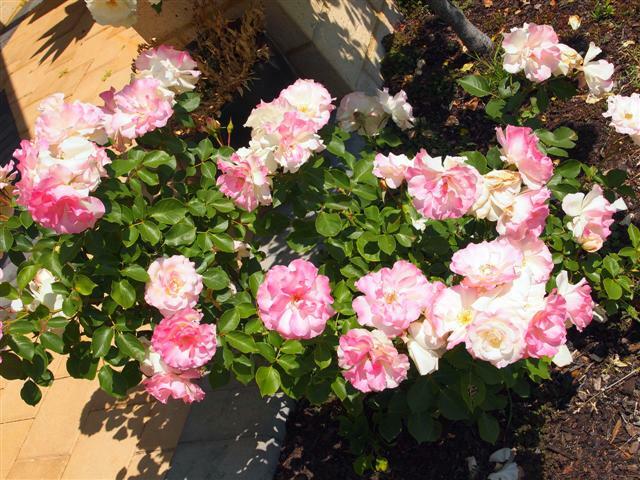 Your rose bush is beautiful! unfortunately everything around here has 'retired' for the season :( The fabrics you are giving away are so cheerful! I'd love either one! Thank you! Hi, I just love No. 1, I think Saffron Craig's quilts and fabrics are fabulous and I love owls. Thanks! I was going to dig up my roses and give up on them but, one is blooming and gorgeous! I think it is the peace rose and it is beautiful. The others are all running branches and no blooms, no matter how much I prune. I think they need a spot where they can just run wild and that's not in my little front garden! Thank you for the giveaway. Either prize would be welcome and worth winning. I wasn't going to enter, but last night I heard an Owl so am taking that as an omen! I don't know the rose in your picture. Is it one bred in the Sothern Hemisphere? We are in the late Autumn season! Lovely giveaway,would love to win,either prize would be welcome by me as well;thanking you in advance! Lurline, thanks for the giveaway! That elephants on parade pattern is so cute! Thanks for the wonderful giveaway!!! I would love to win either one of the packages!!! They are both wonderful!!! Lurline, the roses are beautiful. Nice to keep the summer going! I love # 2...you are sweet to offer us this opportunity! What a great giveaway and #2 would be my choice! I'd like 1, or 2! SO fun. Hi there, I just popped over from Barb's blog and have to say what adorable give aways! I love the owls for sure but both are lovely! Thanks so much. 1 or 2 would be lovely, thank you for the give-away!! wow ,so good you are. Still Going Around in Circles!